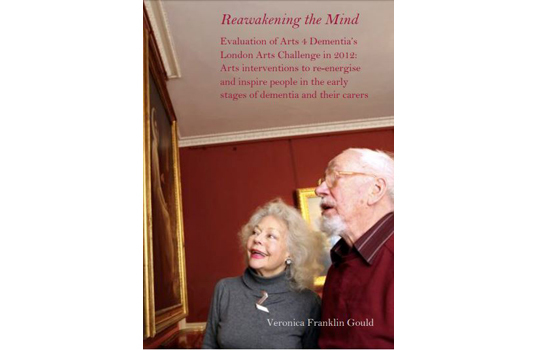 Evaluation of Arts 4 Dementia’s London Arts Challenge: Arts interventions to re-energise and inspire people in the early stages of dementia and their carers. Reawakening the Mind brings together research undertaken as part of A4D’s landmark pilot, London Arts Challenge (LAC) which was awarded the London 2012’s Inspire mark. Evidence gained from 17 weekly projects, covering a range of art forms (including music, photography, drama, painting, poetry and dance) was used to assess the impact of each arts activity on cognitive function and wellbeing for both the person with dementia and their carer. Participation also allowed them to access creative skills, and take part in purposeful social activity. Reawakening the Mind represents an invaluable learning stream for arts organisations throughout the UK. The evaluation supports A4D’s belief that challenging creative activities, led by expert trainers in top-quality venues can inspire people with dementia, and help them extend their active lives in their communities. The publication includes a wealth of useful information for education officers and workshop leaders, including best practice project tips, challenges and resolutions, model contact and evaluation forms, volunteer questionnaire contacts, bibliography etc. With thanks to The Baring Foundation and The Rayne Foundation.